In addition to creating proprietary software applications such as TBS iNsight™ (Osteo), Medimaps operates as a contract scientific organisation (CSO) and as a custom software development company. 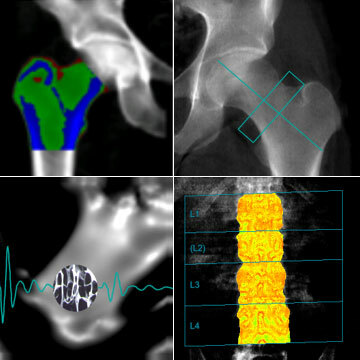 As such, we offer a wide range of services pertaining to our core areas of expertise: bone densitometry imaging (DXA and pDXA); bone quantitative ultrasound (QUS); bone microarchitecture assessment employing proprietary Trabecular Bone Score™ (TBS®) using various image modalities (DXA, X-ray or projected CT imaging); and body composition estimation based on Bio-Impedance Analyzer (BIA) and DXA. We have developed several software solutions for large contract research organisations; automated quality control solutions; secure databases for clinical use; dedicated automation software solutions for university hospitals; and are currently working on several projects using AI, machine learning and 3D modeling.